RIO DE JANEIRO, BRAZIL – The Brazilian government is planning to build at least 23 new hydroelectric dams in the country’s Amazon region, of which seven are set to be installed in the heart of the region, in previously untouched areas of one of the most biodiverse ecosystems in the world, O Globo newspaper reports. After the long-running dispute over the Belo Monte dam, environment activists have expressed incredulity at the plans. The government has already built one large dam at Santo Antônio on the Madeira River (pictured), the Amazon’s biggest tributary, and an even bigger one is under construction at Jirau, photo by Wilson Dias/ABr. Along with the six hydroelectric power stations already under construction, the government hopes these new dams will generate over 38,000 megawatts of power – half the nearly 78,900 megawatts currently generated by 201 operational power stations across Brazil. Two plants are already in operation in the region: the Estreito plant on the Tocantins River, and the Santo Antônio plant on the Madeira River, the Amazon’s biggest tributary. Funding for half the projects – around R$78 billion (US$38.5 billion) – is expected to come from the government’s Growth Acceleration Program or PAC (Programa de Aceleração do Crescimento). Together, the existing and planned sites would increase Brazil’s energy capacity by 54 percent. The work would also come into contact with indigenous peoples’ land. If constructed, the reservoirs for the two largest new plants on the basin would flood an area of land the size of São Paulo city. 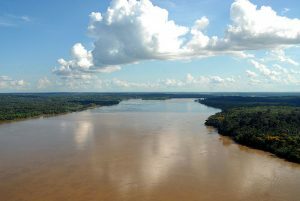 “We are planning with the greatest care and seeking to minimalize the impact [the building of the dams might cause],” reassured Energy Development Secretary Altino Ventura, who said the Amazon basin should account for around half of new energy sources by 2020. João Gilberto Lotufo, director of the Agência National de Águas (National Water Agency, ANA), photo by Elza Fiuza/ABr. 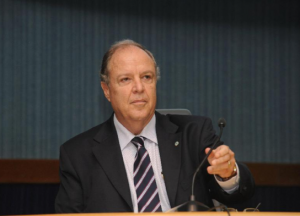 However others, including João Gilberto Lotufo, director of the Agência National de Águas (National Water Agency, ANA), have said that Brazil should stop apologizing for what it has done and focus on the need to get ahead of future energy problems. The local government in Manaus, Amazonas state capital, is clearly aware of the environmental impact the plants could have on the region and its peoples; it wants Brasília to consider other options, such as solar power. The news comes as environmental campaigners, who had been celebrating that work on the controversial Belo Monte dam had been halted, were dealt a setback after builders were given the green light to restart. “The Brazilian government’s reckless quest to dam the Amazon’s wild rivers has demonstrated a disquieting level of authoritarianism, quashing human rights while stripping any semblance of environmental sustainability,” he said in an interview with The Rio Times. “The Brazilian government’s overdependence on hydroelectric power is wreaking an incalculable human and environmental toll in the Amazon,” he concluded. The best solution to fuel Brazil’s economic development without further harming the Amazon, in Mr. Poirier’s opinion, would be to move from centralized to distributed renewable power generation, promoting new investments in solar and wind energy, and increasing the efficiency of existing power plants through smart technology. Brazil’s biggest hydroelectric power station is Itaipu on the Brazil-Paraguay border, capable of generating 14,000 megawatts of power. It is currently the world’s largest such operating facility, but is expected to be overtaken by China’s Three Gorges Dam, on the Yangtze River, in the future. Dams and hydroelectricity – everyone’s into it!! Unfortunately copycats don’t learn from others. They just believe what they’re told by bureacrats and engineers – ‘good for the economic gods’. Whether you talk about the Colorado (USA), Namada (India), Three Gorges (China), Aswan (Egypt) or Mekong (Laos), the people and their cultures lose out – permanently. So of course do the animals, including fisheries. Dams = displacement. People are forced by their governments to move to a lot less arable land. The World Bank, governments, bureaucrats and engineers won’t listen to opposing views. Is killing river systems the way to advance society? More hydro dams lead to more wasted water and electricity. Why do we want to encourage waste and pollution? People need to become thinking community and political leaders. They need to learn to stand up and be counted. They need to protect their communities and environments. Having fewer children would help too with empowerment and education. Have an internet presence too eg blog. Where will the next proposed dam be built? This is terrible!!! What’s happening to try and stop this? It’s disgusting that Brazil’s government would have something like this happen. The amazon are the lungs of the earth! SHAME ON THE BRAZILIAN GOVERNMENT! They just do not want to learn how important the ecosystem is for the World and for Brazil. Now even the more vulnerable ecosystems of the Amazone is being destroyed. Will Brazil ever stop to destroy Mother Nature? What will be left for the next generation, for our children? Hope Brazil becomes wiser and mrs. Roussef will stop the destructions for the sake of Mother Nature! Unfortunately, Brazil is copying superpowers like US, Europe and China. All of which only care about progress and money and not about the environment. Until there is a post capitalist society in which people will look at other options and long term grow of the planet and NOT only at money , we will have things like this. When will it stop? When they will develop a new economic model. China’s develpment is headed the same way or worst. I was arriving in Macau a few years ago and I could see in the water all the trash from China. Why people won’t talk about that also? US polutes a lot also, why not fix inside first or have a serious worldwide rules and regulations to be followed by all and supporting people living in poverty all over the world. No, that does not represent $ and so that is not interesting. While people have 3 cars, 4 tvs, etc etc in the US, others have nothing to eat in Africa. Is that correct? Sorry, I will not read back and just send this as is. May God help us all…..